Sample shown with Panel Monogram. Sample shown with Roman Monogram. This set of 4 deeply hand-etched, sand-carved Maestro champagne flutes are perfect as a special present to you or a friend. 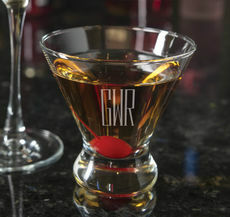 Everyday stemware for people who like to have fun! Pleasant shapes at a pleasant price and they're dishwasher safe. 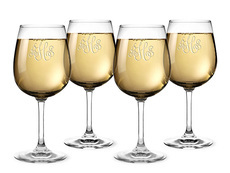 Glasses are 8 oz, 9.5" H x 2.75" W. Your choice of monogram style. Arrives in a gift box.